The Enemy Within is a five part crossover miniseries event that kicks off with this book, which is essentially a new issue of Captain Marvel that’s outside the normal distribution calendar. While it’s not imperative that you read Captain Marvel before this, to fully understand what’s going on I would recommend reading issues 9-12 at the very least. This book is, at its heart, a mystery. While there’s action featuring The Grapplers and dinosaurs, the focus is on Carol’s search for Rose the slightly batty old lady, and the quest to uncover who is the mastermind behind all the unsettling events of the past few issues of CM. All the while, she is dealing with the brain lesion that is supposed to be preventing her from flying. As usual, Kelly Sue DeConnick’s work is above and beyond any other writers I’m reading at the moment (with the exception of Matt Fraction’s current work who incidentally, happens to be her husband). She had me laughing out loud by the second page, and I really adore how she’s giving us a lot of Spider-Woman in Carol’s story. Jess Drew is one of my favourite Marvel characters, so I’m always happy to see any Carol and Jess ‘besties’ interaction. Jordie Bellaire’s colouring is gorgeous, and consistent with her previous work on CM. I really adore her use of retro colours like greens, oranges, and pale blue. It gives the comic an air of the seventies, while still feeling fresh and contemporary. I really hope she continues to work on Captain Marvel, as she’s doing an excellent job. Scott Hepburn’s pencil work has me in two minds. While I really really like it at some points, there are moments where I feel like the faces in particular, are veering too far into caricature territory. I don’t think I’ve ever read anything featuring Hepburn’s art, and while he’s done a good job here, it is a little inconsistent. The design of every page is excellent though, and I’m really impressed with the action scenes, particularly during the pages where Thor and Carol battle a couple of dinosaurs to get to Rose. Beneath all of this action, humour, and intrigue, there’s an undercurrent of unease. Carol’s brain lesion is worsened by flight, and while she tries her best, there are moments where her stubbornness gets the better of her – she really, really hates Cap’s old flying motorcycle. Just how much of Carol’s story is real, and how much is a hallucination? 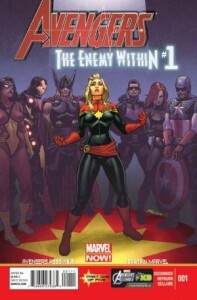 All in all, The Enemy Within #1 is an excellent start to a mini event, and I can’t wait to see how it unfolds.